How long a lens do you need to photograph birds? Conventional wisdom dictates that you need a lens with a focal length of at least 300mm and ideally much longer than that. I generally use my Tamron 150-600mm lens when I anticipate shooting birds, especially small ones. If I want to get even closer, the zoom lens of my Canon SX50 has a field of view equivalent to 1200mm. On Friday, I traveled into Washington D.C. to visit some friends using the Metro subway. I planned to walk a lot and I didn’t want to weigh myself down with all kinds of gear, so I put a 24-105mm lens on my DSLR. For those of you who are not technically oriented, this lens goes from mildly wide angle to mildly telephoto. The camera and lens combination is less than ideal for photographing birds. I couldn’t help myself, however, when I spotted some birds in an urban park and decided to attempt to get some shots. My first attempt was with a Carolina Wren and it was a disaster—it was small and fast and so skittish that I could not get a decent shot. Then I spied a Northern Mockingbird (Mimus polyglottos) perched on a bush in the distance. I took some initial shots and then slowly began to move forward. 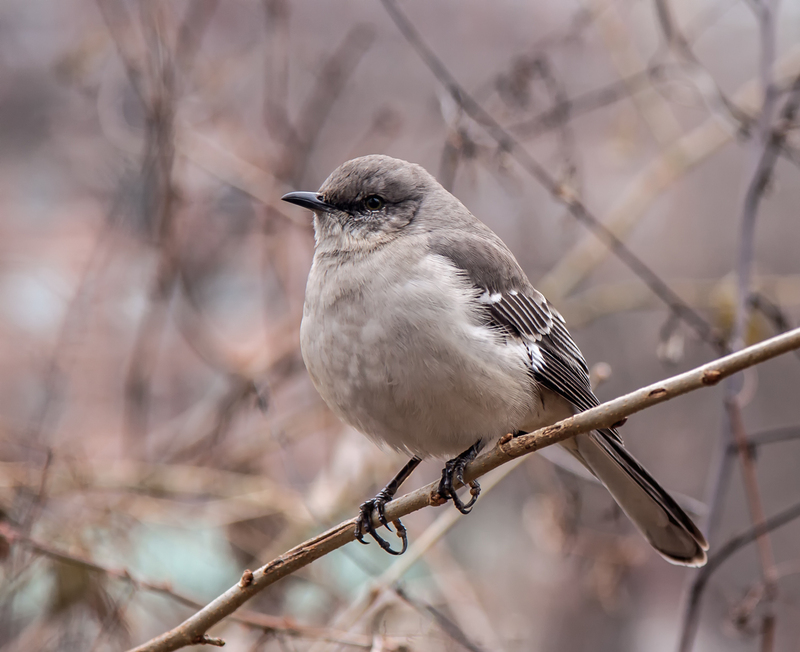 Eventually I was able to get to within about three feet (one meter) of the mockingbird and captured this image. This incident served as a reminder not to limit myself to following conventional wisdom. It is definitely possible to take a good bird photo without a long telephoto lens. Why not take landscape photos with a long telephoto lens instead of a wide angle lens? No matter what lens I have on my camera (or what camera I am using), I try to keep my eyes open for possible subjects. I will then try to capture those subjects as well as I can within whatever equipment I happen to have with me. It turns out that gear is often not the most critical element in making good images—simply being there is half the battle. Pretty good work, Mike. I’d say you had all the lens yo needed. Nice Mike! The old saying is the best camera is the one you have with you! Nice background and portrait, Mike. Amazing that he let you get so close!